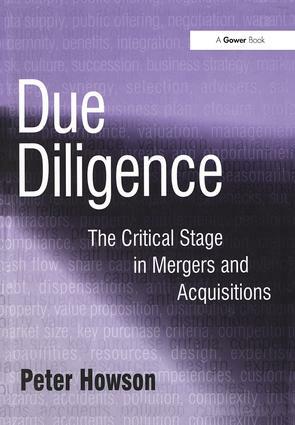 Contents: Introduction; How to structure a due diligence programme; Working with advisers; Financial due diligence; Legal due diligence; Commercial due diligence; Human resources due diligence; Management due diligence; Pensions due diligence; Tax due diligence; Environmental due diligence; IT and production technology due diligence; Technology due diligence; Intellectual property due diligence; Antitrust due diligence; Insurance and risk management due diligence; Appendix A: Purchaser pre-deal due diligence checklists; Information to be requested from the target; Briefing checklist; Financial due diligence checklist; Legal due diligence checklist; Commercial due diligence checklist; Human resources due diligence checklist; Management due diligence checklist; Pensions due diligence checklist; Taxation due diligence checklist; Environmental due diligence checklist; IT due diligence checklist; Technical due diligence checklist; Intellectual property checklist. Appendix B: Financial due diligence - an example of breaking down the numbers; Human resources legislation; Commonly sought management competencies; Myers-Briggs type indicatorsÂ®; UK sources for environmental due diligence; Intellectual property rights; Notes; Index. Peter Howson is a director of AMR International, London's leading Commercial Due Diligence specialist. He has over 20 years of M&A and business development experience both in industry and as an adviser. He gained City corporate Finance experience at Barings, where he focused on domestic and cross-border deals in manufacturing industries, and M&A experience in industry at TI where he was part of the small team which, through 75 acquisitions and disposals, transformed it from a UK commodity supplier into a global specialist engineering company. He has also held senior finance and M&A roles with British Steel and T&N.